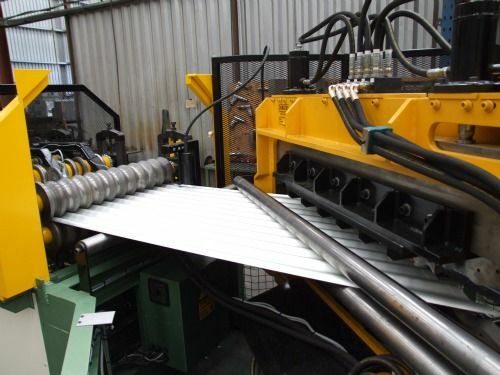 Tandarra manufactures numerous stand-alone Guillotines each year, either as replacements on old machines or for customers with small regional distribution centres that don’t warrant an individual roll former. Instead they ship stock sheet lengths from their nearest major capital city branch, and utilise one of our Guillotines to cut to length locally. These guillotines can be hand operated or hydraulic and either standalone or mounted on a table. Our standard roll-forming lines, generally come with stop to cut hydraulically operated guillotines. That said, we have also previously manufactured pre-cut guillotines, Flying Shears and of course our flagship guillotine - the AngleCut. As we all know, Corrugated Iron is extensively used all over the world for both residential and commercial roofing. Up until recently, a considerable amount of waste has been created due to the need for fixers to cut angles on the sheets on site, in order to cater for the different pitches and gables of roofs. 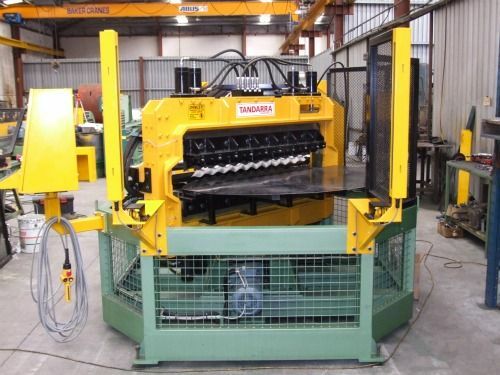 Tandarra is proud to be the only known company in the world to have successfully designed and manufactured a corrugate roll-former with a guillotine capable of swivelling through a range of motion in order to cut these angles automatically during the rolling process. This creates less work for the fixers, but more importantly minimises sheet waste and therefore cost. The AngleCut guillotine has been successfully manufactured on multiple occasions and is currently used exclusively by Fielders in Australia. Click here to make a AngleCut enquiry.